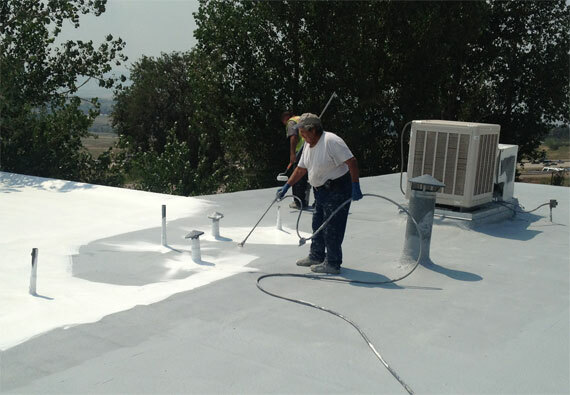 As an authorized UNIFLEX contractor we have roof coating solutions for most types of buildings. These products offer superior flexibility and durability. UNIFLEX offers elastomeric roof coatings in highly reflective white, or can be custom shaded to a variety of colors. These coatings are UL and FM approved, come with extensive warranty coverage and help solve your roof issues while meeting budget needs. If you’re involved in property management, or a building owner we have a solution for you so you can help protect your assets and lower energy costs. Whether your facility’s roof is metal, modified bitumen, built-up, single-ply, or polyurethane foam, we have a coating solution to fit all your needs. These superior coatings can be used in residential applications too. Give us a call for a free evaluation and estimate.